The Henderson Rotary Club has been involved with the Blood Service blood collection in Henderson since the Club’s Charter in 1960. New member Tom Hendriks snr was appointed Blood Collection organiser, a position he very capably performed for many years and became known in the club as “Mr Blood”. The first few years collections were held over a six hour period commencing at 9am, one day at a time and twice yearly. The clubs involvement was to circulate posters advertising the event, then arrange a roster of volunteers for two hours each to serve refreshments and food to donors for a recovery period after giving blood. The volunteers, smiling and friendly welcome to donors after giving blood, especially those attending for the first time, helps to calm and reassure them and is most important to encourage their continuance as donors in the future. Members wives were fully involved in the initial years by providing delicious goodies and also helping their husbands on the roster. This enabled the Blood Service staff to concentrate on collecting the blood which would later be used to save patients lives. The cooking by the wives continued for many years until the number of donors increased with the growing demand for blood, made this action impracticable. A great selection of chocolate and other biscuits is now provided for donors by the Blood Service. 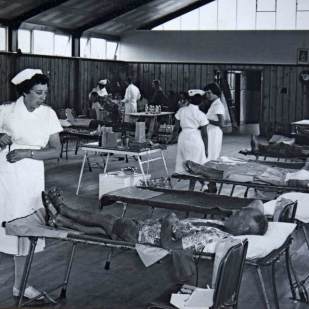 The first blood collection in 1960 was held in the R.S.A. Building in Station Road (now renamed Railside Ave) and continued there for three years before moving to the Waitemata Amateur Athletic Club Gymnasium in Rata Street (now renamed Ratanui St). This building was on the site of the present day Harvey Norman Electrical premises located opposite the Pak-n-Save car park in Alderman Drive. With the demolition of the gymnasium in the 1980’s the venue shifted to the nearby Henderson Borough Council Recreation Centre at the intersection of Alderman Drive and Sel Peacock Avenue, (now known as the West Wave Recreation Centre) until 2006. Whilst the Recreation Centre was upgraded in 2001 two collections were held in the nearby Henderson Bowling Club Pavilion. The year 2007 saw the Blood Collection being changed to the Waitakere Trusts Stadium where it continues to be held at the present time. The Henderson Rotary Club has provided volunteers for every visit to Henderson by the Blood Service Collection Unit, and is very pleased to be involved in this worthwhile community service and plans to continue to assist in the foreseeable future. REMEMBER THE BLOOD SERVICE MOTTO!